Over the last couple of days, the girls and I have been putting up Christmas decorations. The big tree is the living room sparkles with little white lights and ornaments of gold, green and red. My Santa collection graces the coffee table as well as the fireplace mantle and hearth. Snow globes sit on the ends tables and the stockings are hung and ready to be filled Christmas Eve. In the family room sits a smaller tree that is adorned with tiny blue and white lights along with an assortment of whimsical and homemade ornaments that I’ve collected over the years. The decorations are fewer this year as I’ve packed many things away in anticipation of us selling this house and moving to our home in the country. Our country home only exists in my dreams for now, but Christmas on the homestead is part of those dreams. A log home, nothing fancy, but definitely warm and cozy. The kitchen, dining room and living room all sharing the same space. Our large Christmas tree sitting in the corner near the fireplace, looking much like it does today. My Santa collection and snow globes taking up residence around room and our stockings fitting in beautifully above the beautiful stone fireplace. The smaller Christmas tree in the loft and easily viewed from below. 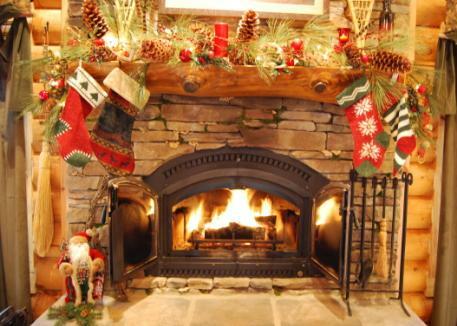 Smells of evergreen and cinnamon fill the air as we snuggle on the sofa reading Christmas stories and sipping hot chocolate, while being warmed by the fire burning brightly in the fireplace. Beautiful, warm quilts on our beds just waiting for us to climb under them for a peaceful night’s sleep in our country home. I don’t know what our Christmas on the homestead reality will become. What I do know is that the beauty and anticipation of the holiday will follow us no matter where we go and it’s wonderful simply because we’re together.